The start of the operation dates to February 2010, when an undercover FBI agent posing as a Russian mobster met with Cristian Rodriguez at a Manhattan hotel. He asked if Rodriguez, a Colombia-based computer tech, could build him an encrypted voice-over-Internet-protocol system to make phone calls like the one he made for Guzman. That conversation was recorded, and they used it to get Rodriguez to flip, reports CNN. Good thing they didn't have Bob Mueller on the case. They still wouldn't know a thing. When will they learn from Osama bin Laden. Don’t use electronic devices. 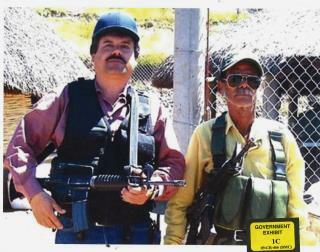 FBI was stumped until El Chapo’s own guy gave FBI encryption keys. Calls were still on some server. Mafia had listening devices planted in their meeting rooms. CIA assets use short wave radio. Aliens use mental telepathy. Wonder what Russians use? The photo caption reads "unidentified man" but it sure looks like William H. Macy playing a role.